International Women’s Day (March 8) is a global day celebrating the social, economic, cultural, and political achievements of women. This year’s theme was #PressforProgress, which focused on motivating and uniting friends, colleagues, and whole communities to think, act, and be gender inclusive. 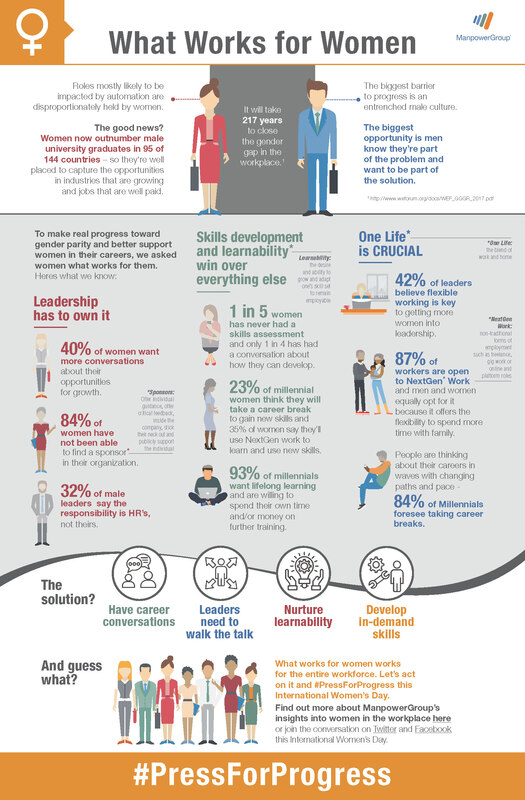 In honor of this special day, workforce solutions provider ManpowerGroup has released an infographic that shows what works for woman in the workforce. “From the beginning, ManpowerGroup has been a pioneer in creating opportunities for women to engage and thrive in the workforce. We were built on strong values of inclusion and gender parity,” says Mara Swan, EVP Global Strategy & Talent, ManpowerGroup. Click on the image below, for a larger view.